Zach is the current Math Instructional Fellow here at Eagle Rock. 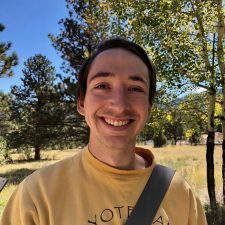 Besides exploring the beauty of mathematics with his students, Zach is a proud member of the Piñon house team and an enthusiastic friend to the many campus pets. Zach comes to Eagle Rock after spending most of his life in the Midwest–he grew up in Iowa City, went to St. Olaf College (where he studied Math and English) in Minnesota, lived in Minneapolis for a spell, and most recently left Chicago after spending a year there teaching Math. Zach is in his second term of service with Public Allies (an AmeriCorps program), and could not be more thankful for both that organization and the wonderful members of his cohort(s) that he has been honored to serve with. In his spare time, Zach likes to read, write poems, solve puzzles/problems/riddles, play most kinds of games, and enjoy the natural beauty of our planet. My rock is my family. I’m really moved by authenticity.